I first had a beetroot burger at Wholefoods Market on a recent trip to New York while trying to escape the cold and the rain. Then on a flying visit to Cornwall last weekend I had them again – this time at the takeaway hole-in-the-wall at Watergate Bay. These can be made in advance and frozen. They work well on the BBQ too, just handle with care. Heat 1 tablespoon of the oil in a small pan and gently fry the onion and garlic until softened. Allow to cool. Grate the courgettes into a muslin or teatowel and squeeze as much water out as you can. Put the courgette into a large bowl along with the peeled and grated beetroot. In your food processor, put the cooled onion and garlic, the drained beans, herbs and tahini. Blitz until it looks like a smooth hummus then tip out into the bowl along with the courgette and beetroot. Add a few chili flakes, mix well then slowly add breadcrumbs until you get a dryish, sticky mix. Season with salt and pepper, mix again then shape into six burgers. Heat the remaining olive oil in a large frying pan then fry the burgers over a medium heat for about 8-10 minutes on each side until browned. 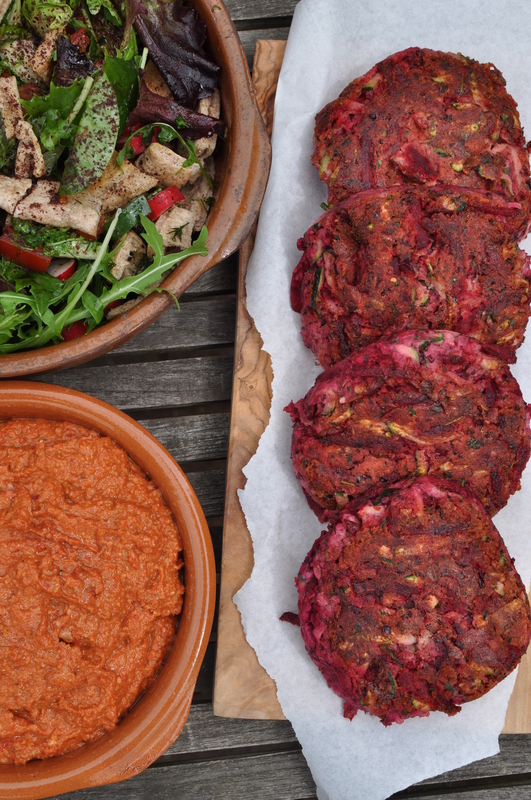 Here I have served the burgers with a smokey walnut muhammara (from Anna Jones’ brilliant book) and a fatoush salad.